Lauren Kus focuses her practice in the defense of professional liability claims. Ms. Kus researches and drafts motions and memoranda in support of summary judgment, complaints, orders, petitions and discovery. She is involved in all phases of the litigation process. Prior to joining Hinshaw & Culbertson LLP as an associate in October 2016, Ms. Kus was a law clerk with the firm since 2015. During law school Ms. Kus was a legal extern at a Chicago firm, and she worked as a research assistant to Loyola Adjunct Professor Richard Devine. She was named a Summer Fellow in 2014 by the Performance Management and Budget Office of Cook County, and she clerked in the Torts and Federal Civil Rights Division of the Cook County State's Attorney's Office. 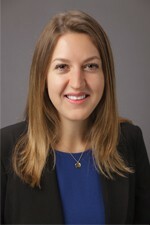 Ms. Kus' law school accomplishments include having been the recipient of a number of scholarships, including the Polish-American Advocates Society Scholarship, the Bohemian Lawyers Association of Chicago Scholarship and the Loyola Academy Scholarship. Ms. Kus served as the chief copy editor of her college newspaper, The Hoya. "Ethical Violations or Politics as Usual? The Role of Presidential Legal Counsel in the Trump Era and What It Means for Legal Ethics," For the Defense, June 2017. "Impaired Lawyers – Partners' Reporting Responsibilities – Duty of Partners and Supervisory Lawyers in a Law Firm When a Lawyer in the Firm Suffers From Significant Impairment," The Lawyers' Lawyer Newsletter, February 2017, Volume 22, Issue 1.